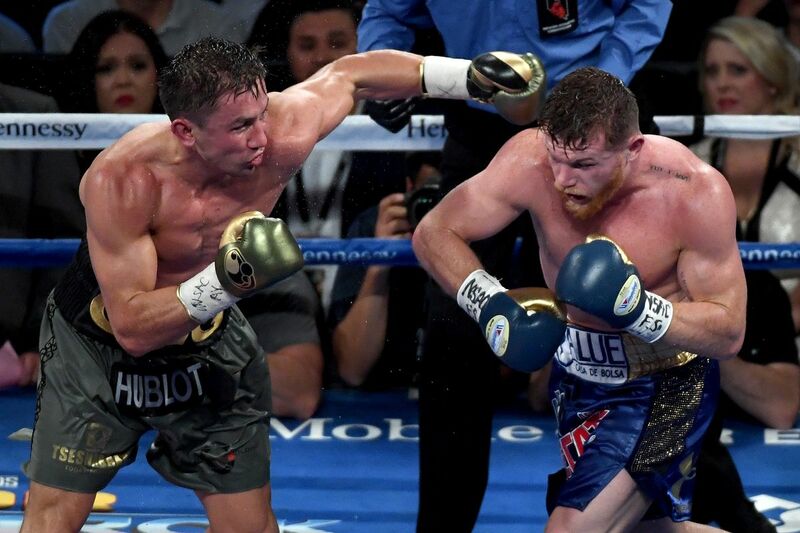 There are two possible interpretations: either Gennady Golovkin (37-0-1, 33 KO) was frozen from nerves in the beginning effectively throwing away the early rounds, or Canelo Alvarez (49-1-2, 34 KO) forfeited the middle rounds by having no offense because he was fatigued. It was probably the combination of the two. Although Canelo partially recovered from his fatigue by fighting in spurts in the later rounds. However, whereas I thought Golovkin won on activity, it was clear that, when Canelo was active, he was the sharper boxer. 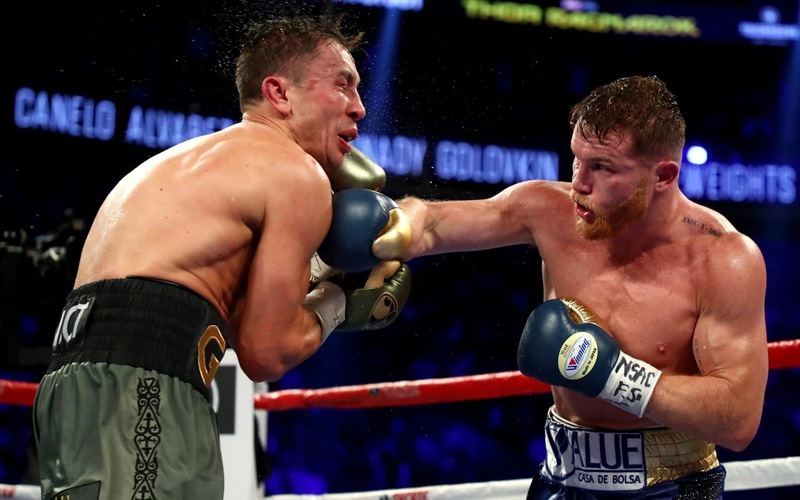 Canelo’s limitation was that he did not have the size nor power to compliment his boxing ability, otherwise Golovkin would have looked for the entire twelve rounds as he did during the first three, and Canelo may have even captured the knockout. As it was, however, Canelo was the smaller man moving up in weight. When they were side by side at the weigh in, Canelo was broader than Golovkin, but – both of them a bit top-heavy – Golovkin appeared to have more depth and density from a naturally heavier skeletal frame. Canelo pulled away from sweeping right hand by a few inches in first minute, looking unsurprised and undisturbed by Golovkin’s power. Canelo bobbed under an overhand right from Golovkin and countered with left hook to body with little over a minute left. Golovkin missed with the overhand right in the last 30 seconds. Golovkin generally pawed at Canelo with the jab but did not land anything authoritative. Canelo missed with a lead overhand right at 1:45 left. Canelo was quicker and became more active with left hook in middle of round. Canelo dipped under Golovkin’s overhand right while against the ropes and threw right hook to body. Canelo did a good job moving his head during lulls to prevent Golovkin from fixating on a stationary target. Canelo landed several overhand rights in first half of round, although Golovkin began round with a little more activity with his jab. Right hook to the body by Canelo at 2:05. Canelo missed with counter right uppercut with 30 seconds left. Good round for Canelo. Counter straight right hand from Golovkin at 2:30. Golovkin planted and threw the left hook upstairs more often in this round; Canelo generally at least partially blocked the left hook with his glove. Canelo stayed against ropes in middle of round for a long stretch of time, presumably taking a rest, and moved his head to freeze Golovkin. It was in this round that Canelo’s output started to decrease drastically. Overhand right by Canelo at 1:40. Golovkin landed clean right hand at 2:00. Canelo nodded his head to say that he was not hurt. (A replay showed that this punch landed behind the ear.) Eventually Canelo threw some combinations to force Golovkin to back up so he could get off the ropes. Golovkin won round on activity. Golovkin more aggressive in opening frame and varied his offense, throwing more right uppercuts. Golovkin seemed to outwork Canelo again. 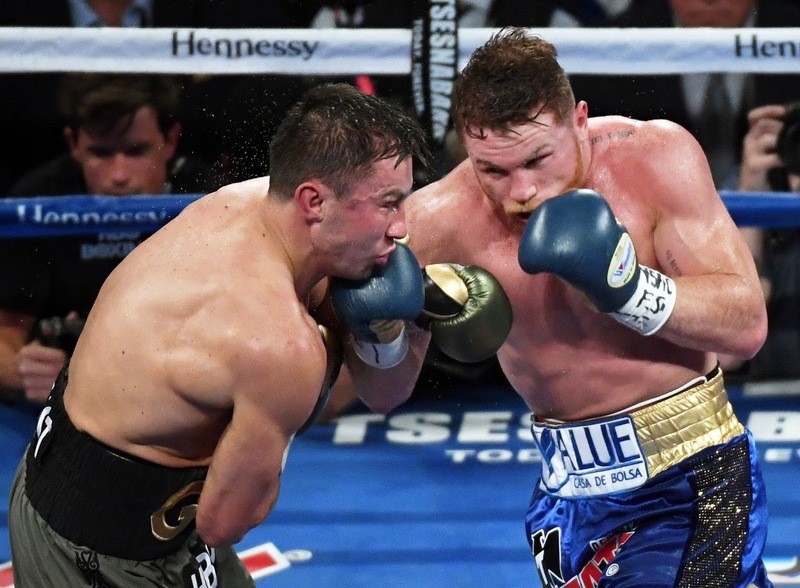 He also loosened up as his confidence grew from the combination of shaking off his nerves and Canelo allowing him to do what he wanted offensively. Golovkin questionably affected by a left hook to the body in middle of round. Golovkin landed a right hand at 1:20. Canelo attempted a counter right uppercut against ropes in the last 20 seconds and left-right hook combination to the body to close the round. Yet another round seemingly won by Golovkin on activity. Right hand by Canelo at 0:40. Canelo’s jab offsets a couple of attempts by Golovkin to land a left uppercut, leaving him off balance. Right uppercut by Canelo at 2:30 that rocks Golovkin’s head back. Golovkin round on activity. Canelo started off aggressively, but was hurt by right hook just thirty seconds into the round that kills his momentum. Right hand for Golovkin at 1:00. Overhand right by Canelo at 1:25 left. Good round for Golovkin as he had been the effective aggressor since the fourth round. Canelo was aggressive at start of round. He backed up Golovkin with his right hand to the temple. Left hook to body by Canelo at 2:10. Competitive round as both guys throw back and forth. Both men showed some noticeable inaccuracy, Golovkin due to Canelo’s head movement, but Canelo more so as a result of fatigue. Canelo threwfrequent counter rights to head and body in second minute. Canelo slapped a bit with overhand right, a possible sign of fatigue. Right-left hook combination landed for Golovkin at 2:30. Competitive round. 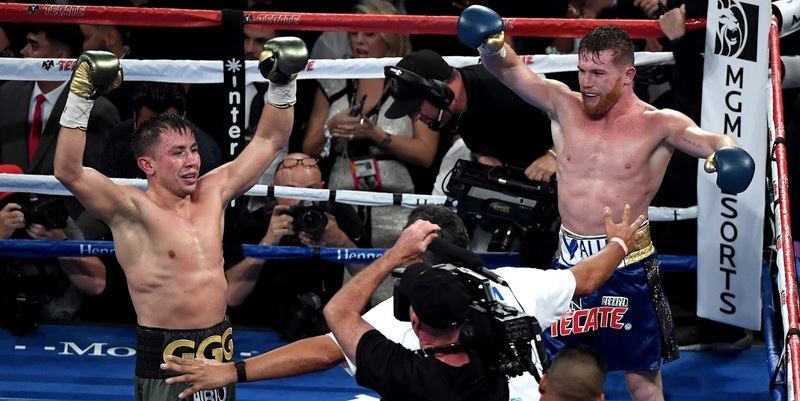 Canelo outworked and outlanded Golovkin with combinations in the first minute. Golovkin landed several right hands while Canelo was against the ropes at 1:10. Competitive round. The final scorecards: 118-110 Canelo, 115-113 Golovkin, 114-114. The result was a split-draw. The source of controversy was the 118-110 card in favor of Canelo by judge Adelaide Byrd, which is deserving of a reprimand as Canelo hardly threw punches for many rounds because he was fatigued. Frankly, each of the cards were generous for Canelo. My round-by-round notes above frequently cite Canelo’s lack of activity, which only mildly improved in the later stages as Canelo would have good starts to rounds but would fade and get outworked in competitive rounds that appeared taken by Golovkin. However, the is a moral victory for Canelo in all of this. He was accused of ducking Golovkin because of cowardice. But he in fact proved that he is a better boxer than Golovkin, only that he does not have the natural size and power of a middleweight to be able to stop Golovkin, nor the stamina to keep up his good work over the course of twelve rounds. Golovkin complained in the post-fight interview that Canelo ran too much and should have stood in front of him to trade. I do not feel sorry for Golovkin at all in that regard. If Golovkin wants to trade, he needs to move up in weight rather than encourage smaller fighters to move up in weight to fight him. It remains to be seen whether or not there will be a rematch. It would be advisable for Canelo to grow into middleweight over the next 1-2 years before challenging Golovkin again, for his stamina and power may have improved by that point. And in Golovkin’s case, he is better off getting the WBO title from Billy Joe Saunders to become undisputed before he loses. With one more fight to tie Bernard Hopkins’ record for consecutive defenses, it would be worthwhile for Golovkin to stick around for at least two more fights. Canelo Saul Alvarez and Gennady Golovkin battle to a controversial draw decision in Las Vegas.